I don’t know about you, but where I live it’s that time of summer where I can’t even bear to turn the oven on inside. Every meal we have is coming off the grill (including dessert some days!). 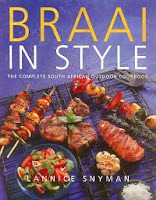 This is an easy chicken recipe from the classic South African cookbook ‘Braai in Style’ that will have people coming back for seconds (really – what isn’t better with bacon??). Serve with ripe, sliced tomato and an arugula salad. Lie the chicken fillets flat, season with ground pepper and smear with mustard. Place a slice of cheese inside each fillet and fold the chicken over to enclose the cheese. Wrap each breast in bacon making sure it’s completely covered. You can prep the chicken up to a day in advance. Braai (grill) the chicken over medium-hot coals for 15-20 minutes, turning carefully once halfway through the cooking. When it is done, the bacon will be beautifully crisp while the chicken has remained incredibly moist.